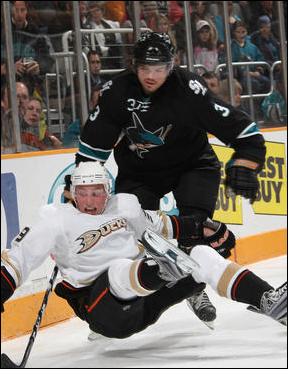 Quite the justice game for the Sharks as they took down the Anaheim Ducks 3-1 tonight. The win puts the Sharks 5-0 against the Ducks this season. Say what you want about regular season games and getting vengeance against teams who ousted you in the playoffs, but this feels awesome. If the Ducks did make it to the playoffs and the Sharks faced them again, these five wins mean nothing, but I’m living in the moment. Cross that bridge when or if they get there. Right now, we beat the Ducks at their best so enjoy it. First thing that must be addressed was the awful feed of the game on NHL GameCenter. I think the feed is up to the broadcasters and Anaheim did a poor job with their cameras. The game looked like it was being viewed through a smog filter. On top of that it was blurry and you have the boring Ducks announce team. A recipe for a non-fun viewing experience. 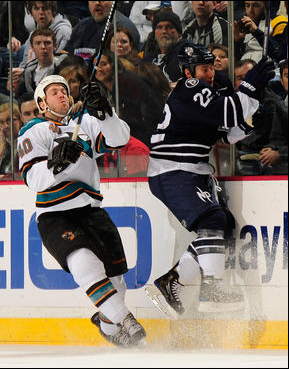 Nevertheless, I and other Sharks fans endured. 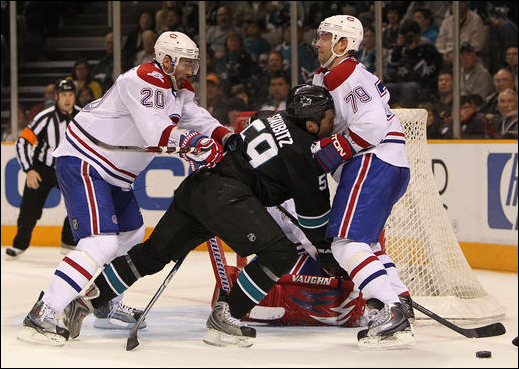 The Sharks had to endure this game without Dan Boyle’s services because of an upper body injury. From the reports I’ve read, he’ll miss the big inter-conference showdown with Buffalo on Saturday, too. He should be back next week. Being on this hot streak recently, the Ducks tried to send a message with a couple fights and keeping things intense. It backfired. Ryane Clowe and George Parros had a dance four minutes in. 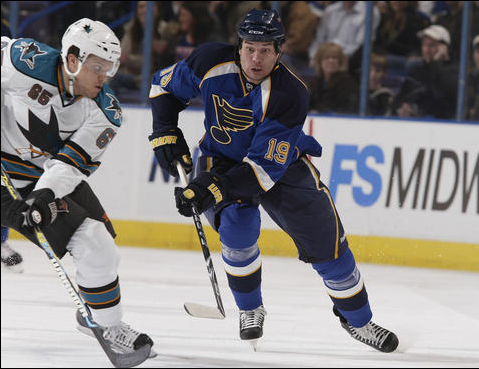 It was a welcome change from seeing Jody Shelley always fight Parros. Clowe beat down Ron Jeremy, Jr., and it started off the game fantastically. Brad Staubitz and Nick Boynton tangoed six minutes later. Haymaker after haymaker ensued, but Bitz got the best of Boynton putting the Sharks in control of the momentum. 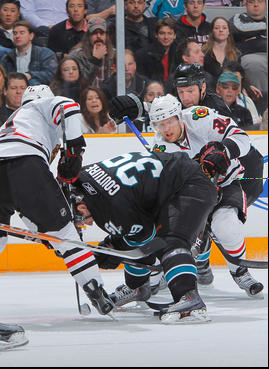 The Ducks were charged with a four minute high-sticking penalty, and it took 3:55 for the Sharks to convert. Better late than never, of course. Marc-Edouard Vlasic scored off a wrist shot near the blue line. Anaheim started to build their own momentum, but it was crushed when Rob Blake found the twine. He was set up by an absolutely beautiful pass from Joe Thornton. 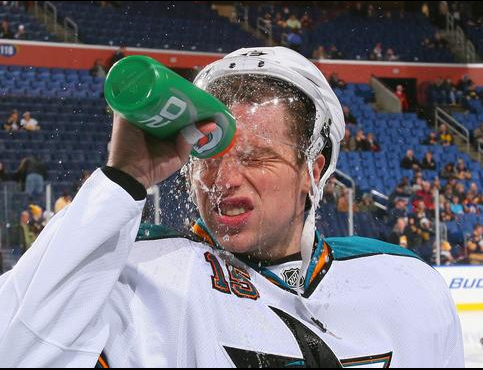 As you probably already guessed, goalie Evgeni Nabokov allowed his trademark one goal. Again. The Sharks held on to win. No extra-man goals for the Ducks. The Sharks’ penalty kill unit stopped all five chances. Hit-O-Meter: SJ 24 ANA 22; Jody Shelley led with four. As I eluded to earlier, the Sabres continue their road trip by playing San Jose on Saturday.